Prime-Hay is Nuhn Forage’s line of dry granular forage additive. Prime-Hay contains specially selected strains of bacteria which rapidly produce Lactic Acid lowering the pH in silage, resulting in a more efficient fermentation. Prime-Hay is also inoculated with Endo-Xyanase and Beta-Glucanase. These enzymes kick start fermentation by providing nutrients for the bacteria. They also convert indigestible fiber into sugars, starches, and amino acids, resulting in a feed that has improved digestibility and most importantly increased feed value. Heating is the result of two basic factors; plant respiration and aerobic bacteria. By rapidly reducing the pH of the silage, Prime-Hay halts plant cell respiration. Prime-Hay also substantially limits the growth of aerobic bacteria which produce harmful acetic and butyric acids. Prime-Hay helps control these potentially damaging aerobic bacteria by utilizing nutrients that the aerobic micro-organisms need to thrive. The pH level is lowered to a point where these bacteria can no longer live and damage your silage. An important factor in storage preservatives is the ability to sustain the products nutritional value and taste. 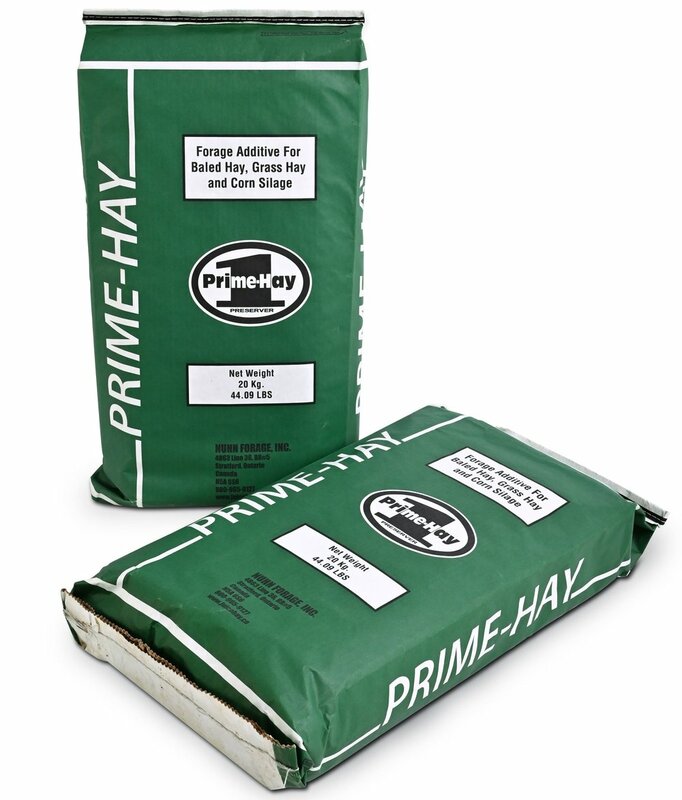 Prime-Hay’s formula promotes increased production of lactic acids. These acids are proven to amplify the nutritional value of the forage. This is the opposite affect of the acetic and butyric acids that are commonly found in poorly fermented silage. When hay is not properly treated, mould will often grow in the bale. This causes the hay to become discoloured and loose it’s freshness. Prime-Hay protects bales, keeping your hay fresh and free of harmful mould and dust.